“Pruno is probably the last thing you’d ever want to drink,” explained former Caña Rum Bar bartender Nick Crouch. He admits that as a mixed-up kid he had gone to jail 23 times, and has had plenty of experience with making prison wine a.k.a. Pruno (a name derived from its once popular ingredient, prunes). Considering that the jailhouse hooch is fermented fruit juice made from moldy bread, oranges, a ton of sugar; kept warm in showers with convicts; and then strained through a used sock, well, Crouch may be right. But even though its flavor is reminiscent of Mad Dog 20/20 and “is like drinking the nastiest sweet and sour margarita but with bread in there and orange,” according to Crouch, it does the job of getting you drunk and is the perfect way to pass a couple hours in the yard. Since you, on the other hand, are as free as a bird with aisles and aisles of Whole Foods at your disposal, what say you make a craft version of this infamous big house brew? 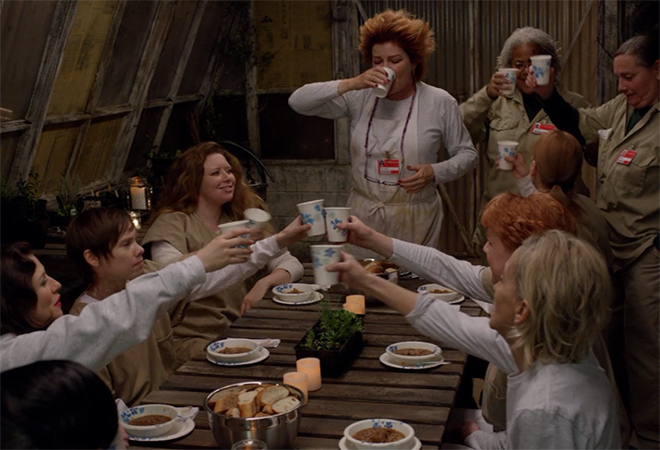 Wouldn’t it be the perfect drink to serve up at those prison-themed parties? Thankfully you don’t have to wait for your copy of Orange Is the New Black Presents: The Cookbook, because here’s Crouch’s own recipe. 1. Combine the fruit cocktail, apples, raisins and oranges in a 1-gallon Ziploc bag and mash them up taking care to not pop the bag. Once the fruit is beaten into a pulp, add the raw sugar and mix. 2. Add the 16 ounces of warm water to the bag and then seal it. Submerge the sealed bag in a sink of warm water for 15 minutes. 3. In a bowl mix the yeast packet with a cup of warm water and 3 teaspoons of raw sugar and wait til it froths up. Add this to the bag of mushy fruit then store in a dark place. 4. Every day for seven to eight days pour warm water (not hot) over the bag then wrap it in a towel and store. Never allow the bag to cool, else the yeast will die. 5. As part of the fermenting process, the bag will bloat up from the carbon dioxide so you’ll need to burp it by opening the bag and releasing the carbon dioxide. Repeat this process every day until there’s no longer any bloating. By the way, I’m checking with Crouch about the possibility of barrel-aged Pruno.